When Morley Muse saw a Facebook post about youth offenders of African heritage that urged the local community to “hunt these so-called human beings”, she thought instantly of her own child. “When I saw that I thought my son is two and a half years old, I made a choice to come to Australia,” the research engineer said. “I don’t know whether these people know that there are black people in this [Facebook] group or not … I spend hours, upon hours, in the lab, my research is going to benefit Australia, not Nigeria where I come from. “Like the new Prime Minister said … whether you became Australian 10 minutes ago, or 10 days ago, or 10,000 years ago, whatever. The comments were quickly deleted by the page administrator, but were made as Melbourne grapples with its response to a number of serious crimes allegedly committed by a small group of repeat youth offenders of Sudanese or South Sudanese heritage. The calls for vigilante justice and deportations prompted Ms Muse’s husband, Bode Muse, to organise a community meeting, where he invited the would-be vigilantes to meet their own community face-to-face. He feels extensive media coverage of crimes committed by youth from African migrant backgrounds has planted unnecessary fear in people’s minds. “When a group of African teens gather together, I don’t blame them for feeling scared because that’s what they’ve seen [in the media],” he said. “But the thing is, are you willing to just be scared or are you willing to educate yourself, are you willing to meet these people and understand who they are? “Why don’t you talk to these people to find out that they are humans just like you. These are parents who are wishing the best for their kids, contributing to taxes, paying their taxes, contributing to the society. “You know, we want to let people see that the African Australian community, we are very much as human as you are. On Saturday morning, around 30 people sat together in Point Cook in Melbourne’s west and began to find common ground on a complex issue. Joseph Deng is many things. A Queenslander. A lover of video games. A track star of boundless potential. Amongst them was 24-year-old writer Tier Ataing, who was born in South Sudan but moved to Australia when he was nine. He took the opportunity of a roving microphone to speak to the group. “Being somebody who is a part of the youth, and this youth that is represented on the news, there are a lot of things that I feel that is wrong,” he said. “Whenever I go on the street, there’s a lot of white people looking at me a certain way, because the media said ‘this is who I am’, but that’s not who I am. “I am somebody who is trying to succeed and become the best version of myself. “We have heroes in our community but [the media] isn’t showing me … who should I look up to if you’re just showing me negativity? “Right now, a lot of kids are feeling down on themselves because you’re telling them they’re monsters and when you continuously tell a kid they’re monsters, eventually they’re going to believe they’re monsters. Tier said he knows young people who fall into a pattern of crime after things deteriorate at home. “Crime has no colour at all, I’ve seen crime, I’ve hung out with kids that are from every single culture from everywhere around the world,” he said. “When you have no love and appreciation at home for anything you do … you’re going to go somewhere to try and find it and most of the time you’re going to try to find it in the street. He also urged his South Sudanese community to focus on strengthening the relationship between elders who have grown up in South Sudan, and their children who have only known life in Australia. Also at the meeting was Dr Mimmie Claudine Ngum Chi Watts, a public health researcher and one of Victoria’s multicultural commissioners. She said many of the youth offenders being talked about were born in Australia. “Most of the children that we are talking about, they’ve never been to South Sudan,” she said. “People have talked about deportation, and you know what I said? 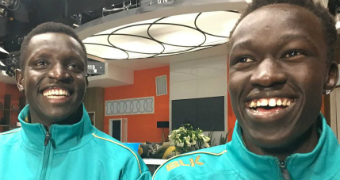 “And we should stop talking about ‘South Sudanese, this person’, because they are all Australians. “Their citizenship is no less important than any of us in this room’s citizenship. Inspector Marty Allison from Wyndham Local Area Commander said the meeting showed the best of the local community, unlike the actions of online vigilante activists. “These particular issues that they raise today are quite complex, and they actually require a whole-of-community solution,” he said. “Definitely social media has an element that sit behind keyboards, and I’ve heard the term ‘keyboard cowboys’, and take great delight in hiding behind some anonymity in some of the comments that they’ve made. Victoria Police have set up Taskforce Wayward to focus on home invasions, carjackings and armed robberies in Melbourne’s western suburbs. Inspector Allison said the latest statistics showed a reduction in both overall crime and youth offending, while the taskforce has identified a group of around 60 male offenders who have allegedly been committing the bulk of offences. “Mainly of African descent, but there’s also a mixture of other ethnicities, including white, Anglo Australians in there as well,” he said. Mr Muse said he hoped the meeting marked the start of an ongoing dialogue to help bring communities together.